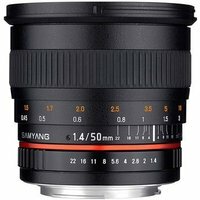 The Samyang 50mm prime lens with fast f1.4 aperture slots between the 35mm and 85mm lenses and is suitable for digital SLRs with a full-frame and APS-C sensor. It gives 46.2 degrees field of view, and thanks to its high brightness value of f/1.4 it comes as a great tool in poor lighting conditions, ensuring splendid image quality and small depth of field. Optics of the lens consists of nine lens elements arranged in six groups (including one aspherical and one hybrid aspherical lens element). To ensure high contrast and faithful colour reproduction, all lens elements have been covered with multi-layered UMC anti-reflective coatings. This lens is great for a wide range of applications, including portraiture, travel, night photography and gigs. Manual focus only.